"The Permian–Triassic (P–Tr) extinction event, informally known as the Great Dying, was an extinction event that occurred 252.28 Ma (million years) ago, forming the boundary between the Permian and Triassic geologic periods, as well as the Paleozoic and Mesozoic eras. It was the Earth's most severe known extinction event, with up to 96% of all marine species and 70% of terrestrial vertebrate species becoming extinct. It is the only known mass extinction of insects. Some 57% of all families and 83% of all genera became extinct. Because so much biodiversity was lost, the recovery of life on Earth took significantly longer than after any other extinction event, possibly up to 10 million years. This event has been described as the "mother of all mass extinctions." Researchers have variously suggested that there were from one to three distinct pulses, or phases, of extinction. There are several proposed mechanisms for the extinctions; the earlier phase was likely due to gradual environmental change, while the latter phase has been argued to be due to a catastrophic event. Suggested mechanisms for the latter include large or multiple bolide impact events, increased volcanism, coal/gas fires and explosions from the Siberian Traps, and sudden release of methane clathrate from the sea floor; gradual changes include sea-level change, anoxia, increasing aridity, and a shift in ocean circulation driven by climate change." 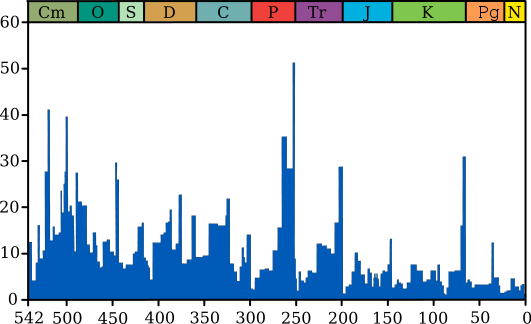 "Plot of extinction intensity (percentage of genera that are present in each interval of time but do not exist in the following interval) vs time in the past for marine genera. Geological periods are annotated (by abbreviation and colour) above. The Permian–Triassic extinction event is the most significant event for marine genera, with just over 50% (according to this source) failing to survive. " "There is enough evidence to indicate that over two-thirds of terrestrial labyrinthodont amphibians, sauropsid ("reptile") and therapsid ("mammal-like reptile") families became extinct. "